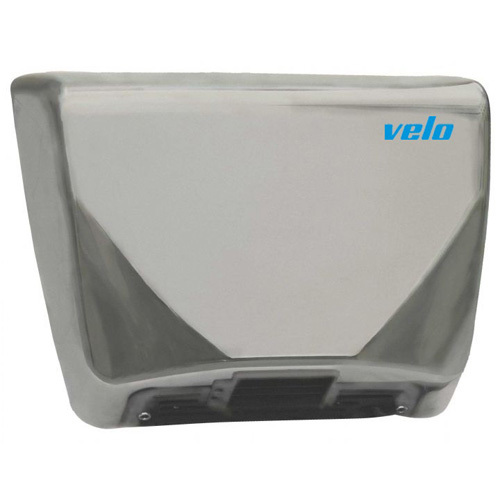 The Velo Thin hand dryer is a medium bracket priced machine that offers high performance, low noise and a beautiful modern compact European design for small areas. It is ideal for medium traffic environments like doctors rooms,small offices, restaurants and theatres. Dimensions: 269 x 363 x 100 mm. Electric total power: 2350 W.
Approximate drying time: 33 seconds. Casing: AISI 304 stainless steel, thickness 1.2 mm. Voltage / Frequency: 230 V 50/60 Hz. Drying temperature at 10 cm (room at 20 ºC): 39 ºC. Protection rating against water projections (IP): IPX1.